The Bravados opens with an ominous stranger in black riding towards a town. He doesn’t say much, but his presence alone creates tension enough. He gets led into town by the local deputy and after a meeting with the sheriff, he is allowed to stick around. His only reason for coming to the city of Rio Arriba is to watch the hanging of four outlaws, at least that’s what he says. But when he asks to see the prisoners, he surveys them and there is nothing but anger in his eyes. As they wait for the hangman from out of town to arrive, Jim Douglas (Gregory Peck) gets reacquainted with the beautiful Josefa (Joan Collins). And nothing is said about their backstory, but there is obviously something between them. He at first refuses her offer to go to church, but requests to walk her over before reluctantly joining her in the chapel. However, back at the jail, the hangman is not who he appears and stabs the sheriff in the back with the four outlaws getting away taking a local’s daughter with them. So the town is in a fury sending a posse after the fugitives led by Douglas. And one by one Douglas tracks down the culprits. First, ambushing Parral (Lee Van Cleef) who he shoots after the man begs for his life to be spared. Next, he takes down Taylor and hangs him from a tree after dragging him behind his horse. The posse does eventually get the kidnapped girl Emma, but Douglas is far from satisfied, crossing the border to Mexico to finish the job. He guns down Zachary in a bar and his only target left is Lujan (Henry Silva). But that’s when things change. Douglas is knocked out of his blind rage for a moment. Because this whole vendetta began after his wife was raped and murdered. He went on an obsessive quest to find the four culprits and although these four no-goods constantly denied seeing his wife, he just went after them anyway. It is Lujan who finally makes Douglas realize he made a mistake. In this epiphany, Douglas realizes he is little different than these four outlaws, willing to kill mercilessly, even in the name of justice. He goes back to town a hero, but he heads straight for the church where he confesses his wrongs to the local priest. He is a man with a lot to wrestle with, but also a lot to live for thanks to his daughter and Josefa. 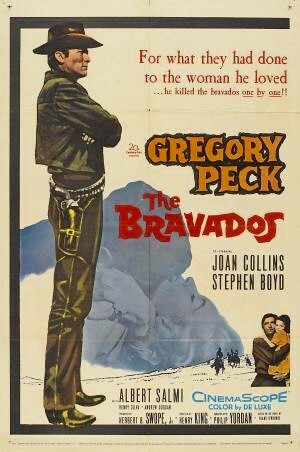 Although not quite as iconic and memorable, The Bravados, in a sense, is Gregory Peck’s version of The Searchers. This Henry King western in CinemaScope is noteworthy for allowing Peck to play another morally ambiguous character. He is no Atticus Finch. This entry was posted in 1950s, Drama, Western and tagged Gregory Peck, Henry King, Henry Silva, Lee Van Cleef, Review by 4StarFilmFan. Bookmark the permalink. Very fine movie, beautifully shot and powerfully acted, that leaves you with plenty to ponder by the end.